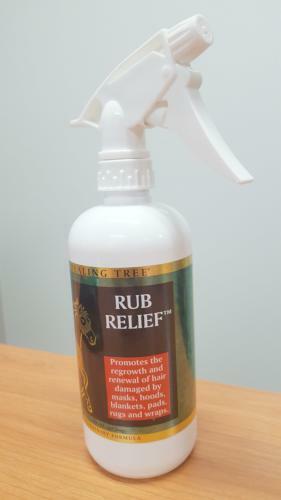 Healing Tree® Rub Relief is a proprietary blend of conditioners, emollients, lipids, protein, antimicrobials and natures best soothing agents. Healing Tree® Rub Relief is used to aid in the regrowth and renewal of hair that has been damaged and rubbed by covers, masks, hoods, pads and wraps. All you need to do is apply generously to affected areas and rub in thoroughly.